By now you have surely heard of jewelry company Stella & Dot – an Avon-esque company that sells directly to you through their local stylists. One of their stylists, Tara Hill, contacted us and wanted to share some of her newest pieces that would be perfect complements to a Clemson Girl’s gameday outfit. Stella & Dot carries a large collection of charms in addition to the ones above…including alphabet, birthstone, inspirational and whimsical charms. 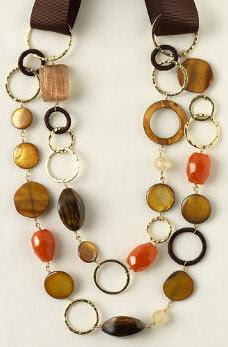 If you’re looking for more of a statement piece to pair with your gameday outfit, try this gorgeous brown and orange necklace. Love this! And don’t forget your little Clemson girls on Valentine’s Day – surprise them with gameday jewelry of their own. 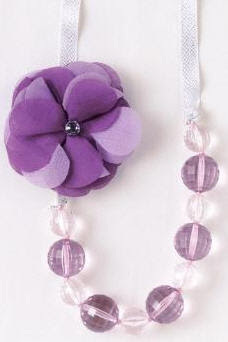 Stella & Dot has a little girls’ jewelry line too – this purple flower necklace is so cute! You can shop all of Tara’s gorgeous Stella & Dot jewelry by visiting her website or contacting her directly by email: taraellishill@gmail.com. Tara is located in the Raleigh, NC area and is available to host Stella & Dot trunk shows at your house – trunk show hosts get free credits towards jewelry. Contact Tara if you live in the area and are interested. She’s also looking to expand her stylist network. Selling Stella & Dot is a great opportunity for those of you who want more free time at home and with your kids. Let Tara know if you’re interested in learning more about working as a Stella & Dot stylist. Don’t forget to visit Tara’s Stella & Dot website – whether you’re shopping for gameday jewelry for yourself or gifts for others – there are plenty of gorgeous accessories to choose from.